"A fine, dignified and effective collection glowing with the radiance of integrity." Samuel Barber (1910-1981) is best-known today for his Adagio for Strings, which was originally written as the slow movement for an early string quartet, and has become one of most played pieces of classical music. The Adagio was first perfomed in its orchestral form by Toscanini, with the Essay for Orchestra in the same concert. 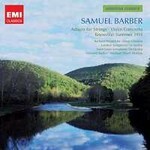 These works are typical of Barber's output, being overtly European in outlook and language.Barber composed music in most genres: two symphonies; concertos for piano, cello and violin, two grand operas; ballets; choral works; chamber music and a great number of songs. This selection of works includes the beautifully reflective Knoxville: Summer 1915, written to a sensitive text from James Agee's unfinished novel A Death in the Family. Also included is the Violin Concerto with it's lovely slow movement and the Overture to a School for Scandal, which was the first of Barber's works to be performed by a major orchestra.